Home Fishing OFF THE HOOK: No Boat? No Problem! OFF THE HOOK: No Boat? No Problem! In our lucky little fishing village, it may be perceived that a boat is necessary to catch certain kinds of fish, or a multitude of fish. However, without access to a boat, there are still some great fishing spots anglers can take advantage of (even some who will rent rods if you don’t have your own). Grab your rods and reels as we head out to explore some active spots to fish in Destin. Probably the most popular and first thought of fishing spot without a boat is our white sand beaches. With miles stretching across the Emerald Coast, there is no shortage of spots to fish, but a few key factors could help you be more successful. When searching for a spot, look for a more secluded area where there are less swimmers. Also, check the water for color changes and wave breaks as that will signify better feeding spots for the fish. Popular fish caught off the beach include pompano, redfish, whiting, hard tails, bluefish, ladyfish, black drum and jack crevalle. 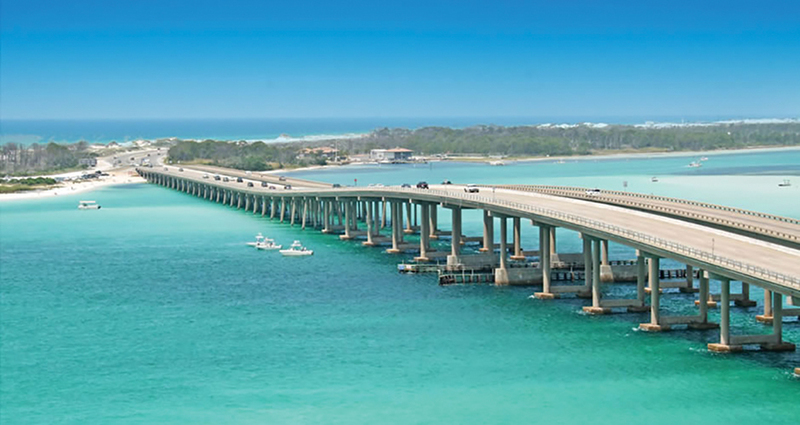 The Destin Jetties is another local favorite. Many anglers will walk the stretch of rocks that line the Destin Pass to claim their spot for the day. With the way the tides change daily through the east pass, the jetties create a prime feeding area and attract a variety of fish like bluefish, redfish, flounder, trout, king and Spanish mackerel, sheepshead, and a variety of baitfish. This is a spot recommended for adults only, as the jetties were constructed with large boulders to climb over and there is no smooth walkway to reach the end. While making the drive over the Destin Bridge, you can often see lines dropped in the water while fisherman anxiously await a catch. The bridge has become one of the key places to fish here in our lucky little fishing village for a multitude of reasons. Another place that the tides are always changing, bringing in bait fish for larger fish to feed on. The bridge pilings also create structures in the water which fish are known to hang around. One key thing about bridges – always be considerate of boat traffic under you when fishing the bridge so as not to tangle your lines with other anglers! Lastly, another popular fishing location is our Okaloosa Island Pier. Located roughly four miles west of the Destin Harbor, the pier stretches almost a quarter mile into the Gulf of Mexico and anglers of all skill levels can try their luck. Most frequent catches from the pier include Spanish mackerel, whiting, ladyfish and bluefish, but some noteworthy fish have been caught there as well. Cobia, king mackerel, tuna, even Tarpon weighing over 100 lbs. and a few Sailfish have been pulled up from the water. Redfish, bonito, jack cravelle and pompano are also frequent catches in this area. The pier has a tackle shop on site that will also will rent rods and reels, so even the novice angler can spend a day trying their luck. In any of these locations, the best time of year to fish is from March-November, but fish could bite all year long if we have a warm winter. If a cold front is coming, fish the days leading up to that when the temps are slightly warmer. The bite is also always best when the tide is rising or falling and it’s common to see fish start to school up along the beaches. Practice makes perfect my friends, and we look forward to seeing you out on the water with tight lines!